The Sametime 3.0 Community Server Toolkit is a collection of Java components for building applications that affect the functionality and services provided by a Sametime server itself. This server toolkit is intended to be used alongside the various Sametime client toolkits (such as Java, C++, and COM), to build robust and creative e-business applications leveraging the Lotus Sametime technology. 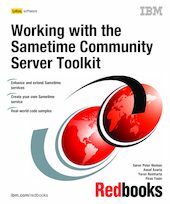 In this IBM Redbooks publication, we describe the Community Server toolkit’s architecture, and introduce the concepts behind developing server-based Sametime applications. The second part of this book focuses on providing more advanced sample applications to demonstrate the key capabilities of this toolkit. Many of these samples can then beused as building blocks for your own applications. This book is intended for Java developers who have experience using the Sametime Java client toolkit, and want to use the Sametime Community Server toolkit to enhance application logic on the server side. Those not already familiar with the Lotus Sametime architecture itself, or the Sametime client toolkits, should first read the book "Working with the Sametime Client Toolkits," SG24-6666. All of the samples in the book are available in source format from the IBM Redbooks Web site.